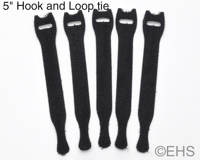 Pack of 5 -- 5" black hook & loop (Velcro) wire ties. 5" long and 3/4" wide (at the widest part). These are our favorite style of reusable tie, and each has a slot to feed through itself to secure it to the wire so it will not fall off when not in use. Then when the cable is in use, they can have a secondary function of securing a cable to a mic stand or other gear. Good for about 3" circumference or about 1" diameter.